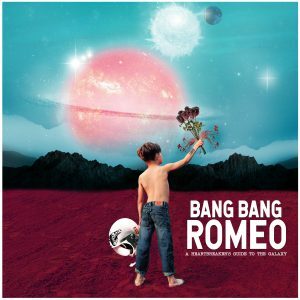 The UK’s hottest rising trio the brilliant Bang Bang Romeo have announced their debut album ‘A Heartbreaker’s Guide To The Galaxy’ with celebratory Christmas shows in their hometown of Doncaster. Bang Bang Romeo are the first UK signing to Eleven Seven Label Group and will be released on Allen Kovac’s Five Seven imprint. Recorded in Birmingham, New York and Los Angeles, the band have worked with a roster of industry heavyweights on the album, including producers and co-writers Nick Furlong (Avicii, All Time Low), American Authors guitarist James Shelley and his production partner Michel Heyaca (Tinashe, Nick Jonas), New York’s Heavy (Goo Goo Dolls), and the UK’s Red Line Music team. Meanwhile, the record has been mixed by Grammy winner Mark Needham (The Killers, The 1975), and mastered by Howie Weinberg (Arctic Monkeys, Beastie Boys, The Clash). Earlier this year the band signed to the Eleven Seven Label Group (home to the likes of Papa Roach, Nelly Furtado, and Nikki Sixx’s Sixx:A.M.), played festivals up and down the country with a highlight main stage performance at Isle Of Wight Festival’s huge 50th birthday celebrations and bagged themselves a stadium tour supporting pop icon P!nk for summer 2019. Their Isle of Wight performance was broadcast by SKY ARTS and included in the BBC ONE Documentary ’50 Years of The Isle of Wight Festival’.